This is the perfect Traditional Macaroni Salad. It's loaded with ham, cheese, and veggies, in a creamy dressing. Perfect for BBQs and Potlucks! Prepare macaroni to al dente according to package directions. After macaroni is cooked, drain well and cool to room temp (see notes below). 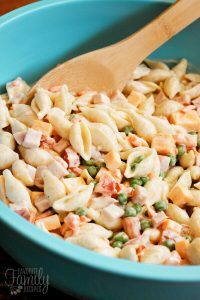 In a large bowl toss macaroni with ham, cheese, peas, carrots, and other mix-ins. This is the perfect, traditional macaroni salad. Always a favorite at BBQs, potlucks, and family gatherings! Trust me, it is the best!